Bleacher Report was seeking a way to further enhance its content offerings by delivering short video highlights while games were still in progress. But with nearly 85 percent of users accessing Bleacher Report content on mobile devices, the company needed to ensure that short video highlights could be created quickly and streamed flawlessly, regardless of the viewing device or bandwidth. Delivering video content to users across different devices is not a trivial task. To do so, Bleacher Report would have to manipulate and optimize each video to suit every viewing device, viewport and bandwidth. When the development team began to work on its video highlights offering, Bleacher Report had been managing images with Cloudinary for nearly a year. The Cloudinary solution offered a rich feature set that Bleacher Report used to optimize and manipulate images by simply changing the parameters in the image URL, and deliver them responsively to users – capabilities that were not possible with the company's homegrown image management system. After seeing how quickly and easily integration and implementation was for the image solution, Bleacher Report decided to extend its relationship with Cloudinary for video management, as well. Bleacher Report automatically extracts interesting moments from the live footage based on specific criteria. The raw file is then uploaded to Cloudinary, which processes it in real time to deliver a video, enhanced and optimized for viewing on any browser or device, at any bandwidth. Behind the scenes, Cloudinary eliminates many of the technical complexities that content producers like Bleacher Report experience when trying to optimize the video experience. Cloudinary automatically adapts the video resolution and quality, transcodes it into a streamable format, implements adaptive bitrate streaming and delivers the videos through a fast, reliable content delivery network. This ensures that viewers experience a smooth playback irrespective of device requirements or internet connectivity. 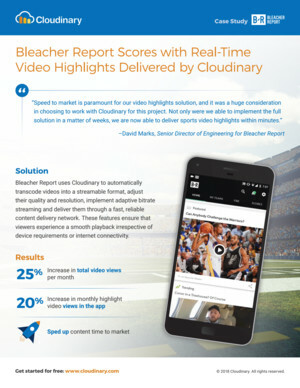 Cloudinary’s seamless integration and ease-of-use accelerated the development process, enabling Bleacher Report to go from concept to an automated video highlights offering in under five weeks. "Speed to market is paramount for our video highlights solution, and it was a huge consideration in choosing to work with Cloudinary for this project," said Marks. "Not only were we able to implement the full solution in a matter of weeks, we are now able to deliver sports video highlights within minutes." Though just recently implemented, Bleacher Report is already seeing a 25% increase in total video views per month, and a 350% increase in video views within their gamecasts experience. In addition, Bleacher Report said that it has been able to increase its monthly 3-second video views by 35 percent and grew the monthly highlight video views in the app by 20 percent.